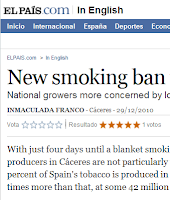 El Pais has made available an English version of some of its contents on their website. If you want to read it, go here. I think it is a wonderful idea. You can read this and then compare it to the contents in Spanish to better understand it.